We have been lucky to receive many thankyous, reviews and recommendations from clients over the years. There is nothing better than receiving an email or letter from a customer saying thankyou or 5 star review, it is what makes our day! Want to leave feedback yourself? Please do so on our FEEDBACK PAGE. My friend sent me a photo of her flowers, and they looked beautiful. She called them "superb." Thank you so much for adapting and making it such a gorgeous arrangement. She loved it. Thank you! Your flowers were amazing. Debbie loved them! I just wanted to say thanks for your speedy and helpful service getting flowers to my mum today. I really appreciated you ringing the hospital to confirm the location they should be sent, and how quickly they arrived. Excellent service. Thank you ladies - the flowers arrived on time and were much appreciated. I even had a phone call from my granddaughter, and she was thrilled. Rosemary. Hi Guys – My wife loved the flowers! Thanks very much! Thank you so much for the flowers. The recipient called to say that she was very touched by them. Also thanks for following up about the message that went awry. Wonderful service. Thanks again! Hello!! Thank you so much for my mums flowers. She called crying with happy tears. They are just beautiful!!!! Thank you so so much, it made her day!!!! Warmest regards, Sally. Hi my mum loved the flowers and the photo she sent me was even lovelier than what I was expecting based on the internet images. I was very happy with the service and quality. I'll order from you again in the future. Thank you!! Hello, The recipient just loved them thank you very much and for the phone call for the information I missed putting on the card. I ordered the Pretty Posy Pot - Bright, for a friend and she was delighted with them, they look beautiful, thank you! Thanks. I heard the flowers were wonderful… Cheers…Karen. Hi there Embassy Florist team Thanks so much for the tulips you delivered to my girlfriend for her 50th birthday. Although there was a slip up on the day, she was absolutely delighted and surprised to receive a further surprise the next day. As soon as I raised my concern, you contacted almost immediately to suggest a way to fix the situation. Thanks so much. Dear Esther, Thank you for the excellent service and reply. All is good, really appreciate your help! Beautiful fragrant flowers! Thank you..
She loved the flowers! Thank you so much. Thank you, I saw a photo of the flowers and they were absolutely beautiful. I have used these guys four or five times for various occasions over the past few years. All of my orders have been online via their website and they have always delivered what they promised. The quality of the flowers has always been great and deliveries within the given timeframe. I messed up the delivery details on my most recent order and they were extremely helpful with making alternate arrangements. Highly recommended! Hi, I am offering feedback on my order of 2/5/2017. The flowers were beautiful, and my mother was thrilled with them. Thank you. Thank you all - excellent flowers excellent outcome ! Cheers Colin . Hi, Thank you so much for delivering flowers to my colleague, she absolutely loved them. I will certainly be sharing this with my friends, family and colleagues. 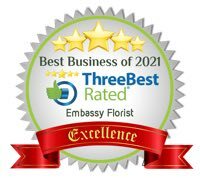 If we ever need a florist – Embassy florist will be the place we go to. The flowers were stunning, thank you! Just wanted to say thank you for your prompt assistance today! The flowers looked gorgeous and my bestie was delighted! I really appreciate it. Thanks again and I look forward to ordering again. Just wanted to say a big thank you for putting together such a loverly wreath and organising its delivery to AWM. The service was quite moving and I was very pleased with your efforts as the wreath certainly stood out amongst the rest. I ordered a wreath on behalf of the Royal Australian Signals Association of the ACT which was delivered to the AWM on Saturday 7 Nov 15. I would like to thank you so very much for the obvious extra care you took when choosing the beautiful purple colour scheme, the wreath was an absolute delight, and by far the very best one on display out of the many presented at the commemoration service. I will certainly be recommending you to other military associations in Canberra, and also to my daughter when it comes time for her to choose a florist for her wedding. I just wanted to say thank you so much for the flowers. They were absolutely beautiful and got used for a number of events as they were so gorgeous! Thanks so much for once again doing such a wonderful job for me. Hello: I just wanted to thank you for getting the flower order to the church for our relative's funeral on May 25. I received a note from my cousin, the son of the deceased, expressing how much the flowers meant to them and how beautiful they were. As we are far away in Canada, it was nice to hear how smoothly this long-distance process went, thanks to you. Thanks so much for the lovely floral decoration of orchids for my daughter-in-law. They are very modern and bright. They got it and said it was lovely! On Tuesday evening I called your shop from England to order some urgent funeral flowers for my dad for the following day.Despite the extremely short notice and limited information I had about what I needed and where it had to go, my family said a beautiful arrangement arrived in time. I have no idea who I spoke to but I wanted to say thank you very much for all your help at what was a very stressful time for me. I couldn't actually get to the funeral myself and without your kind help and patience I wouldn't have been able to send a floral tribute either. I am really grateful for the trouble you took to get the flowers there for me. Kind regards from a very grateful customer. Wendy M - England, 19th March 2015. Justin E - SE Queensland, 28th January 2015. My mother loved the birthday flowers I sent her today - thank you so much for sending them on the same day at such short notice! Thank you for delivering the orchid so quickly. It was beautiful and the recipient was absolutely thrilled! Many thanks. A big thank you for delivering the beautiful flowers to my fiancee. He loved them and the chocolates too! The hand written note made the whole thing an extra bit more special! I will definitely be ordering from you again. The ordering and payment part was quite quick and simple too, which is a big relief for someone like me who's ordering from outside Australia. Hi, My name is Aislinn, I ordered a florist's choice bouquet this morning. The recipient loved it! 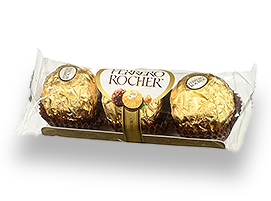 Thank you for making a beautiful bouquet with chocolates, at the cheapest price (including delivery) that I found online for Canberra, and for delivery so quickly. I really appreciate it. Extremely reliable online ordering system. The choice of flowers in the box I sent today were absolutely gorgeous. Thank you for helping me bring a smile to someone's face and for your part in brightening their day. Many thanks for the great service today for some last minute flowers for our daughter in Garran. Our order was very late and your service was great. Flowers arrived right on time and were lovely. I would like to thank you so much for the beautiful flowers I ordered a few days ago for my friend. She said they were gorgeous and are making her smile. Thanks for you great service, I'll recommend you to my friends and will certainly use your site again. I also often buy flowers from your shop. Having ordered flowers the morning of my elderly grandmother's birthday, I was beyond impressed with the quality and the speed of your service, not to mention the generous amount of absolutely gorgeous flowers that arrived at my grandmother's door that afternoon. My grandmother rang me in tears of joy to tell me how she had received some of the incredible flowers she had ever seen and that the delivery man had wished her a happy birthday with the biggest smile on his face. Thank you for making a 75 year old lady so very happy. Highly recommended. Thank you for your delivery, the third I have ordered from you, of a splendid birthday bouquet for a very ill friend. It has delighted her and her visitors at the nursing home. I must say your excellent website and reliable service are a great support for concerned friends and family who are distant from Canberra. Hi, I just want to say how pleased I was to hear that the bunch of flowers (orchids) that you delivered to my aunt yesterday were described as the most beautiful arrangement she had ever received! I would have put the feedback on the website but dont have a google account at present. I just wanted to say thanks. I was told that the flowers were really gorgeous. My mother said that the flowers delivered to her last week from you are the nicest she's ever received. Thank you so much. Thankyou for your very professional handling of my sympathy order. The flowers were delivered on time and beautiful. Your contact of details to me post order were very much appreciated and reassuring as I had no knowledge of your company and found you on the net. I would certainly use you again. The product made up was absolutely gorgeous and even better than what I had expected. It was just a lovely arrangement. I would definitely order from here again in the future. Thanks so much for your time and assistance! Just a quick note to thank you for the roses you delivered to my wife to celebrate our 27th wedding anniversary today. The roses were stunning!!. as was the packaging. My wife was delighted. Thank you so much .Ps... she loved the chocolates,nice touch guys. I recently ordered the "affection" roses for my girlfriend, and they were simply amazing, I would like to commend your services, I was thoroughly impressed. Order flowers 15mins to 10 on a saturday morning, just got it in on time! Very fast and reliable, great bunch of flowers - worth the value. Will use again in the future I'm sure. Thank you very much for delivering/creating a beautiful arrangement of flowers for me. The recipient was delighted. Thanks, also for allowing me to change the delivery instructions at for promptly organising and delivering the arrangement a day before originally scheduled." "My wife's mother died a week ago and she received flowers from Embassy Florist Canberra and they were spectacular and certainly lifted her spirit. I have viewed your website and found it very user friendly with a large choice, I have placed an order today and will certainly be using it in the future. Thanks"
I placed an order with you for Mother's day morning and would like to say thank you. The roses were delivered on time and it really went how I planned and even better. Thank you for your great service, professionalism and quality products. If it weren't for your website, Making Sunday a special day would not have been possible. Cheers from Chile South America." I wanted to let you and your staff know what a wonderful job you did. I am posted overseas and had ordered flowers on-line for my wife’s birthday. Every detail was perfect and I am told the arrangement was absolutely gorgeous. Thank you all for helping me in making my wife’s special day brighter. With much appreciation." "Thank you for the gorgeous flowers delivered to me on Sat. July 25th on behalf of my son in London. Delightfully presented, beautifully packed and thoughtfully delivered they are an absolute joy. Thank you for your thoughtfullness." "Would just like to add a few words of appreciation for the wonderful flowers you put together for me recently. It is obvious that you are really passionate about getting the best flowers for the appropriate occasion, My wife was delighted so thanks again!" “I just wanted to say thank you so much for the absolutely amazing displays on Tuesday. I was over the moon with how fantastic the venue looked - from the flowers in the entrance, to the arrangement beside the lectern, to the table centrepieces - it was all stunning. It almost brought tears to my eyes when I walked in." Thank you so very much for all your help keeping the secret, & for the superb flower arrangement. The flowers were just beautiful & quite a talking point. "Thankyou for the beautiful flower arrangements you did for my daughter's wedding. Everybody was commenting on how nice the bouquets and reception were. I would be happy to be a reference for any future customers." "Thanks so much for delivering what you promised. I needed to send my girlfriend something special. I am so glad that you helped make her birthday so special when I couldn't be there to spend some time with her." Thank you for delivering the beautiful bouquet to our Mum!! We really appreciate your service, expertise and talent for making your flowers a beautiful gift! Thank you again!"